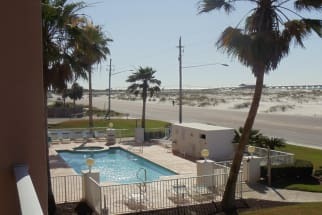 Welcome to the Grand Beach Resort in Central Gulf Shores! This luxurious resort is filled with many different properties offered by Emerald Coast by Owner. Our vacation rental condos are state of the art and have an elegance to them where you may not want to step foot out of them! We recommend you do though, because our gorgeous beach and water are not all we've got to offer! This area is full of fun activities for everyone. The Grand Beach Resort is the perfect location for your next beach vacation! You can always go deep sea fishing out in the ocean, go fishing off the shore here, play a round of golf at an awesome nearby course, or go paddle boarding! If its a great meal you want, well we've got plenty for you! The Gulf is a delicious eatery outdoors where you can enjoy all the scenery the area has to offer you. Another great spot is Cobalt, a very popular spot with a dock for boats too! In conclusion, yes we've got a gorgeous beach with some scenery and sunsets you can't get anywhere else, but that isn't all the area has by any means. We highly recommend a trip here, it'll be one to remember! Emerald Coast by Owner is pleased to bring you the best Vacation Rental Properties by Owner in Grand Beach Resort and more! Browse our listings below and book online today! When you book with Emerald Coast by Owner, we make it easy for you to choose where, when, and what you want to do on your trip. Contact the property owners directly with any questions and they will gladly assist you in the booking process. be sure to book online today! Tommy & Christy's Beach Retreat!